It’s only natural to want your family to be active and healthy, so we’ve put together a huge range of activities that you can all enjoy, both individually and together as a family. Spend a family day in your local club and you'll have plenty of choice – go swimming, play tennis, eat in our DLicious cafebar while they climb around the playframe or use our free iPads, then visit the spa or join a group class while we keep your kids busy. And we’ve lots of fun activities that will keep your kids happy too, we even do parties and events! So when you want to relax, have fun and all enjoy some quality time together, we’ve got everything covered. As our little ones grow older, keeping them fit and healthy can be a real challenge, so we’ve listened to our members and have made it easier for children to stay active and get more from their David Lloyd Club. Giving kids the freedom to swim independently in a safe environment can really boost their confidence and help improve their skills. We’ve made our pools more accessible so children aged 10-12 years old can now swim independently during family swim times. All they need to do is complete a shark test – performing some supervised swim drills in the water - and they’re all set. There’s a whole new world of exercises and equipment to explore, which we know can appear a little daunting, so we’ve made our gym more accessible from a younger age. Children aged 10-12 years can now use the gym when supervised by a parent or the gym team. All they need to do is complete a ‘Start Up’ gym induction with our gym team and hit the gym floor. Check out your local club for more details. Our DLicious cafebars have something for everyone, with family areas, kids’ playframes and quiet Adult Only lounges too. They're ideal for meeting friends for a coffee, a drink, or a meal from our DLicious menu. With high quality, fresh ingredients, the menu has a balanced choice of meals and snacks that are ideal for a healthy, active lifestyle. It includes yummy low-calorie dishes, power food that’s perfect after you’ve been working out, a fabulous kids’ menu and even some tempting treats. Try something new today – it could be your next favourite! If you want your kids to stay active and have lots of fun, just sign them up for our DL Kids programme. We’ve deliberately timed the sessions to match up with our group exercise classes, so you can enjoy the club while they play a sport, some games or have fun in an arts and crafts session. It’s a really great way to keep them running around, learning new skills and sports, and having fun as they make new friends. 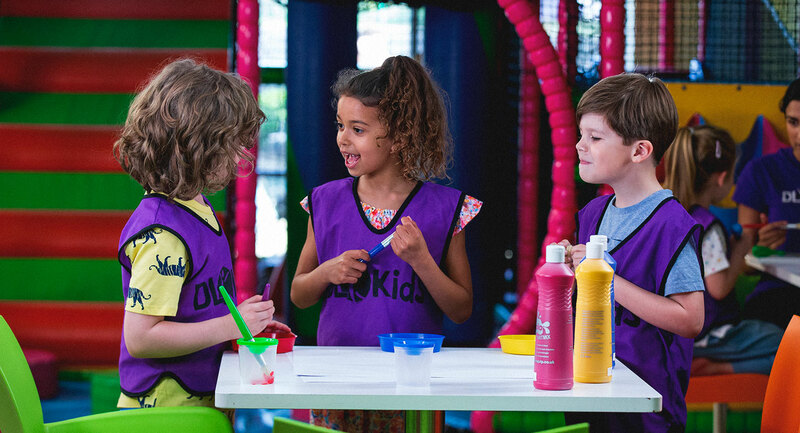 Find out more about DL Kids at your local club here. Our jam-packed holiday clubs give kids aged 5-13 an exciting mixture of swimming and tennis, team games and activities, arts and crafts - and a lot of fun. Visit our Holiday Club page for more information. Our swimming, tennis and gymnastics All Stars programmes let your kids learn new skills in a fun environment. In fact, our All Stars programmes are so good, they’re endorsed by the very best – the Swim England and the Lawn Tennis Association. Our expert coaches start with the basics and then gradually teach them ways to improve and progress in their sport, while having lots of fun along the way. The only problem? They could soon be better than you! We’ve got lots of ways to keep your kids busy, whatever their age. Our fully qualified crèche staff really enjoy caring for small children and helping them play and learn while you enjoy some ‘me’ time at the club. Besides our DL Kids, Holiday Active and All Stars programmes for kids, we also run special gym, tennis and swimming sessions for members aged 11+, giving them plenty of ways to keep fit and have fun. And if your children are 14 or over, they can even join some group classes, including Zumba and BODYPUMP™. We love arranging kids’ parties so if you want to make your child feel extra-special, look no further. We do amazing themes, fabulously tasty party food, plus party bags and invitations, and lots of fun and games – simply turn up with the cake, some guests and the super-special birthday child! And it’s not just birthdays – we can also arrange special events for any age group, for any occasion. Celebrate Halloween, Easter and Christmas, or host outdoor summer events or family sports tournaments – just tell us what you want, or leave everything to us!